"Social media. Been there, done that." I've heard it too many times . . . when further prompting then reveals a cursory LinkedIn profile, an echo of a Twitter account, and a few half-hearted dabbles in mobile recruitment. Listen folks, that's not "doing" social media. I am not here how to tell you how to do it because it varies for every person, every organization, every vision, and every goal. Google your name and find that you are not the only one of you around. 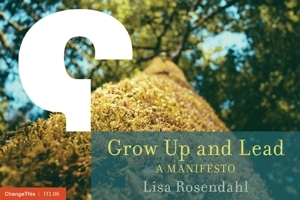 Not only is Lisa Rosendahl an HR professional and writer, she is Creative Connections and she is the Director of Baltic Art Center. Fortunately, for me, they are creative and artistic and not shady criminals - not everyone is so lucky. Receive an email from an ex-fiance (who found you via a link to your blog on a friend's blog)wondering, "how's life?" (better since I left you). Receive an email from the spouse of the ex inquiring about the nature of your relationship with her husband (ask your husband). Watch your daughter's face light up when she is linked to by Mary Jo Asmus and receives praise on her words (priceless). Reconnect with your Battalion Commander and get to bring the past into the present again (well hello there!). Discover people, right in your own backyard, to fix what ails you (new friends). You don't get to say "been there, done that" until you've really been there and experienced it. What has happened to you that opened your eyes to the benefits, risks and realities of social media? Where have you been and what have you done?